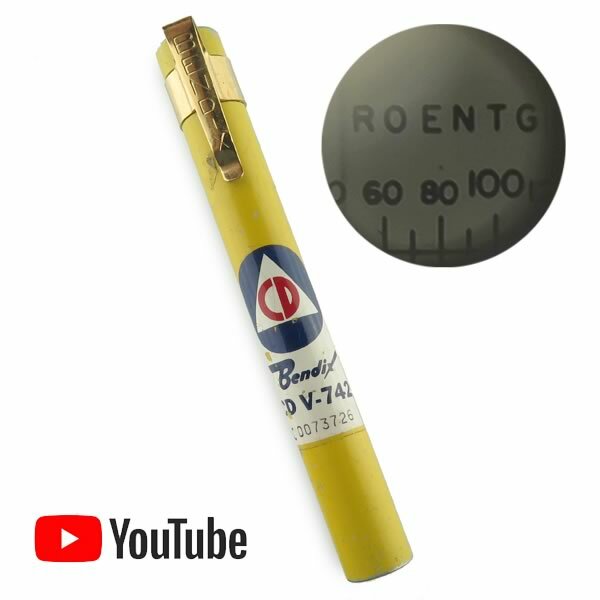 Pocket clip-on antique radiation dosimeter pen type CD V-742 by Bendix was made during the Cold War years 1955 to 1965 for the Civil Defense Administration (CDA). This pocket dosimeter is basically a quartz fiber electroscope. It was meant to be used with a charger (which we do not have) so we are selling them "as-is" for customers who wish to have a piece of Cold War memorabilia or for experimentation. Scale is marked 0-200 Roentgens. When you point it at a light and look through the lens you will see the scale and a pointer that would have indicated the amount of exposure. Size about 4.5" long x 0.5" diameter. Used "as-is". Has scratches or blemishes on outer case.